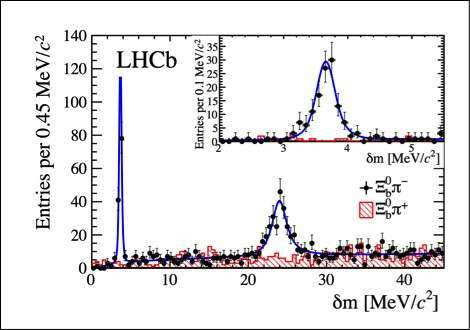 The mass difference spectrum: the LHCb result shows strong evidence of the existence of two new particles the Xi_b'- (first peak) and Xi_b*- (second peak), with the very high-level confidence of 10 sigma. The black points are the signal sample and the hatched red histogram is a control sample. The blue curve represents a model including the two new particles, fitted to the data. Delta_m is the difference between the mass of the Xi_b0 pi- pair and the sum of the individual masses of the Xi_b0 and pi-. INSET: Detail of the Xi_b'- region plotted with a finer binning. 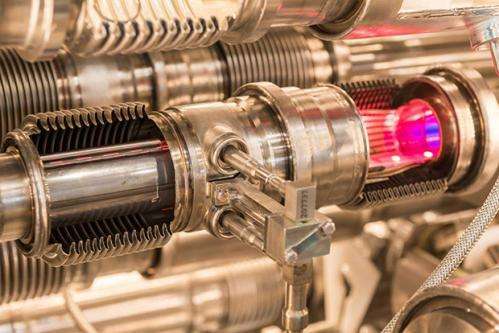 (Phys.org) —Today the collaboration for the LHCb experiment at CERN's Large Hadron Collider announced the discovery of two new particles in the baryon family. The particles, known as the Xi_b'- and Xi_b*-, were predicted to exist by the quark model but had never been seen before. A related particle, the Xi_b*0, was found by the CMS experiment at CERN in 2012. The LHCb collaboration submitted a paper reporting the finding to Physical Review Letters. "Nature was kind and gave us two particles for the price of one," said Matthew Charles of the CNRS's LPNHE laboratory at Paris VI University. "The Xi_b'- is very close in mass to the sum of its decay products: if it had been just a little lighter, we wouldn't have seen it at all using the decay signature that we were looking for." "If we want to find new physics beyond the Standard Model, we need first to have a sharp picture," said LHCb's physics coordinator Patrick Koppenburg from Nikhef Institute in Amsterdam. "Such high precision studies will help us to differentiate between Standard Model effects and anything new or unexpected in the future." Errr, these are "turtles all the way up." Six times the mass of the proton, in fact. @Da Schneib, sorry to bother you again but is the 'beauty' a new quark? My understanding was of 6 quarks;(u,d), (t,b), (c,s). b is "beauty" or "bottom." You'll also see t called "truth" or "top." Why do we not see similar "paired" particles for protons and neutrons ? It's because at those low energies, the spin pairings vs. anti-pairings don't make enough difference to change the mass of the particles. Thus, the partners are indistinguishable from the normal particle. Remember that the masses of the quarks make up only a very small fraction of the mass of a neutron or proton; but in particles that have these heavier quarks like s and c quarks, not to mention the b quark, the quarks make up a much larger fraction of the mass. The rest of the mass is in the gluons and in the energy of the quarks orbiting under the influence of the color force within the particles. In protons and neutrons, this overwhelmingly dominates; in heavier baryons, like the Xi (and there are other types of Xi, BTW, than just these two), the mass of the quarks is much larger.